A workshop student shapes a tenon on the end of a round pole post. The term “timber framing” refers to a set of traditional techniques for framing a house from large timbers. Posts, beams, rafters, and other members are assembled with various kinds of joinery, the most fundamental of which is the mortise-and-tenon joint. A tenon or tongue carved onto the end of one timber fits snugly into a mortise or pocket in another, and both pieces are then locked together with a wooden dowel. Since the entire connection is made out of wood, it can expand and contract as a unit over time and will never rust. Precision-built timber frames are much more durable than conventionally built wood frames that rely on metal fasteners. There are thousands of timber-framed buildings in Europe and Japan that have lasted for many centuries. Timber framing is usually done with milled or (in pre-industrial times) hand-squared timbers. 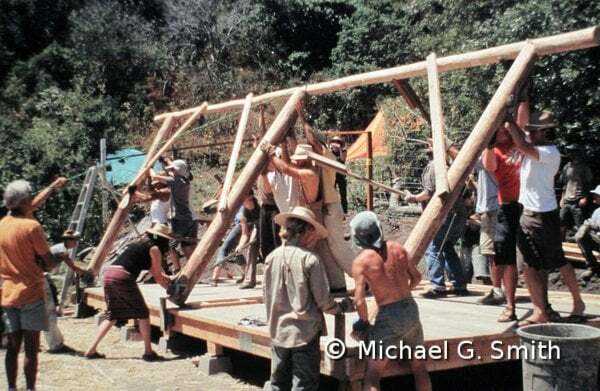 While living at Emerald Earth, Darryl Berlin and I developed a timber framing system for use with round poles, most of which are tapered and not quite straight. Our system allows for precise joint layout on an irregular piece of wood. This enables the use of much smaller-diameter trees than conventional timber framing does, and saves the energy needed for milling. Small-diameter round poles are a ubiquitous and under-utilized resource in forest areas recovering from non-sustainable harvesting. Timber frames are fastened together on the ground into assemblies called “bents.” Raising the frame requires the coordinated effort of a large team.